A couple months after we launched our change.org campaign, we were informed that Iwanami Shoten, the publisher of the Kojien dictionary, would be making revisions to the definitions of feminist and feminism in the new 7th edition Kojien, anticipated to be published in 2018. We were excited for this news, and began planning some kind of event or action to celebrate it once it was published and the new definitions could be confirmed. We opened the pages of the new Kojien on January 12th, 2018, the day it was out in stores...and had mixed feelings. While there were some positive changes, the negative changes eclipsed them. Our plans to celebrate quickly changed into plans of protest. 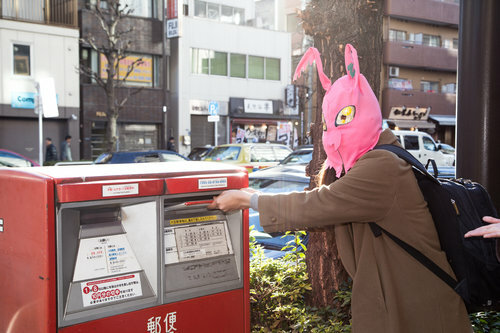 Iwanami Shoten held an event on January 14th to promote the publication of the 7th edition of the Kojien. TGT held a peaceful protest outside the venue, in the form of an "oden picnic," in part an homage to the young Korean man who held a noodle-eating protest when changes to the definitions of feminism in the Korean dictionary were being discussed. 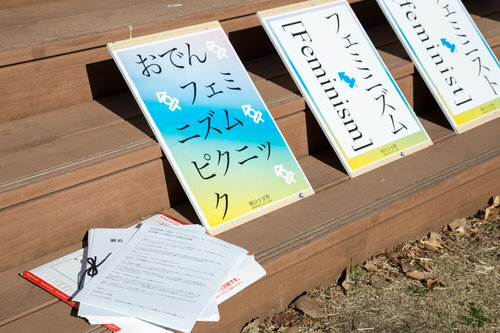 Troop members talked with the visitors about the new definitions, about feminism, and finished off the event by dropping off the petition from the change.org site in a mail box, to be delivered to Iwanami Shoten. This will become an ongoing project until we see definitions in the Kojien that truly reflect the ideas and goals of feminism.